In what can only be described as anti-climatic, we have finally learned what this spring's 'mystery' plant is. Why anti-climatic? Because we watched and waited with bated breath for months to see what our little mystery was. 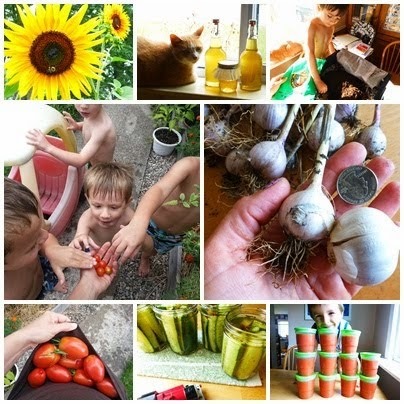 What we thought might turn out to be a surprise melon or cucumber--perhaps some heirloom variety that we would then save seeds from and christen with a name of our own--has actually turned out to be a weed. And not a particularly nice weed, at that. I have become a big fan of many so-called weeds like purslane and lambs quarters, but this baby will take over an entire area if left to its own devices. Our mystery volunteer plant is bur cucumber (not to be confused with this cultivated variety that is indigenous to Africa which is sometimes also called bur cucumber). 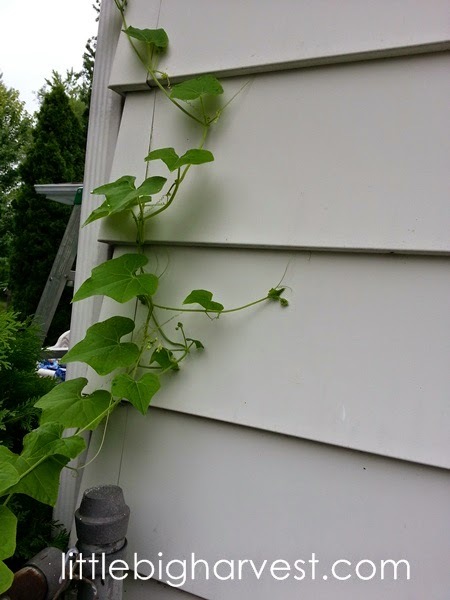 This weed spreads voraciously and produces many little bunches of tiny, hairy cucumbers. While I'm sure the itty-bitty cukes are not poisonous, I haven't seen any critters go after them and I really don't think I'll be taking the effort to shave them for a sample, either. Bur cucumber is well-known to soybean and corn growers because of its tendency to maim sections of crops and its uncanny ability to evade herbicides. It's been known to grow so quickly and and with such strong tendrils that it will literally uproot a mature corn plant. It's a curse to the conventional farmer. But to us, it has not lived up to its reputation as a dreaded curse; it's a fun curiosity. It hasn't hurt anything and has been interesting to watch develop, as volunteer plants always are. The bees have enjoyed its blossoms, and for that alone it has earned its keep. Where did our mystery plant come from? We noticed the plant growing in one of our tomato transplants early this spring. 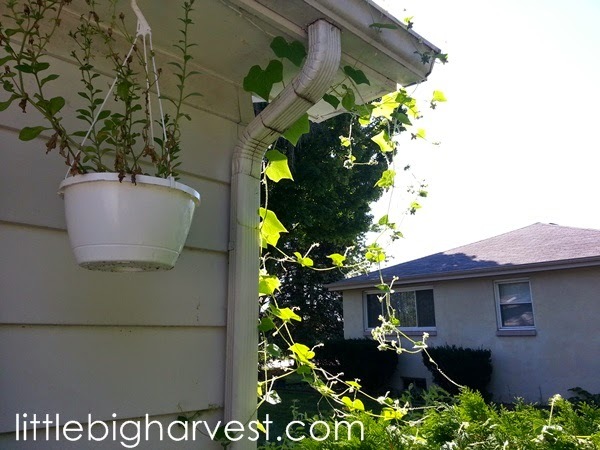 The compost I used for my potted transplants was of the bagged variety from a big box store. Labelled 'organic compost', I have used many of these cheap bags of compost to supplement our not-yet-sufficient supply of homemade compost. If it sports bur cucumber seeds, and if bur cucumbers are known to exist in conventional fields, I have to wonder about the source of this 'organic compost'. At any rate, the seedling appeared. I knew it had to be some kind of curcurbit (cucumber, melon or squash) due to the shape of its leaves. We were a bit excited to see something mysterious appear like this. Rather than pull it and toss it into the compost, we carefully dug the baby out and gave it its own pot. It struggled to grow for while, and we didn't give it a lot of special attention--we left it alone in its pot, curious. After a month or so outside, it started sending scouting tendrils out to anchor. Seeing it would need something to climb, we moved it to the end of the south garden, next to the fence and by the end of the house. From there it flourished, climbing the house and beginning to flower. 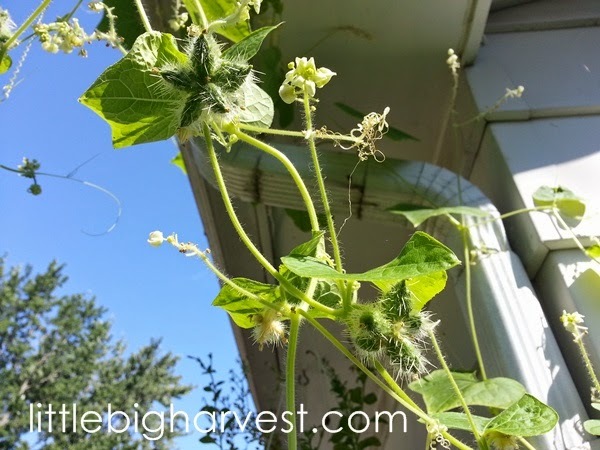 A few weeks ago, we watched the blossoms turn into funny little bunches of what looked like tiny, hairy cucumbers. Our google search didn't take long, and soon the identity of the plant, bur cucumber, was clear. I have been warned via the internet that this hardy weed will seed prolifically and could take over the house. From the looks of the now-hundreds of tiny hairy cucumbers, I believe that could happen! Each tiny cucumber contains just a single seed, but there are dozens on cucumbers on this single plant. 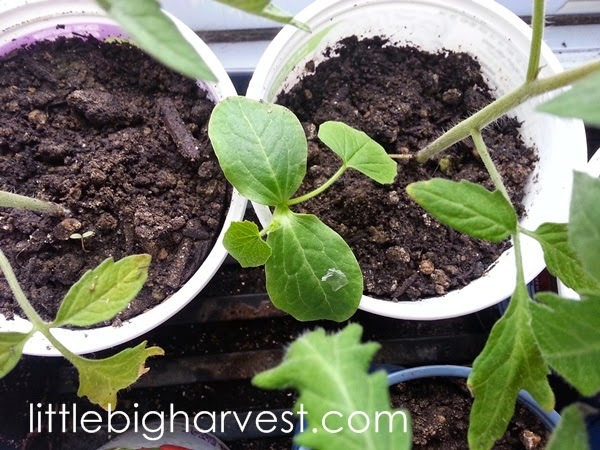 Next spring we'll be vigilant about any new baby bur cucumber plants that pop up in that garden area, because quite honestly, as much as we've enjoyed the mystery and discovery, we would rather grow something a bit more useful in its place. Now that I see the potential of that sunny corner of the house, I'm thinking maybe a trellis with some dainty sandita vines will go there next spring. Sanditas (Mexican Sour Gherkins) are our new favorite fun vegetable that we grew this year, and would do just fine in that spot. So, bur cucumber, you had your moment in the sun, but this will be the only season we'll welcome you with open arms!